Al Brady, left, and Indiana State Trooper Paul Minneman. 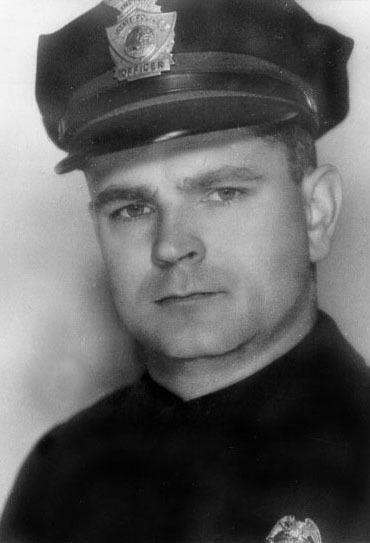 Trooper Minneman was the gang's third victim, and the second law enforcement member gunned down by the gang. Dalhover later told the FBI they burned their car outside of Indianapolis, stole another one and headed to Chicago to dispose of the jewelry. They delivered the jewelry to a fence but before they could return to pick up the money … they agreed to sell it for $850 … Brady was arrested in Indianapolis on May 11. Shaffer was also arrested there later that day, and Dalhover was arrested in Chicago on May 15; Geiseking was located Sept. 12 in Henderson, Ky. All four were held in Indianapolis to await trial for the murder of Rivers. The three remained in the county jail until Oct. 11 when, as inmates were having breakfast, the trio assaulted the sheriff and took his gun. They then stole the car of a passing motorist who had stopped to aid the sheriff as he grappled with the three inmates. They escaped, but two days later, on Oct. 13, the FBI joined the chase when it filed a complaint at the federal court in Cleveland against the three charging them with the transportation of stolen jewelry, valued in excess of $5,000, taken from the Kay Jewelry Store in Lima on April 27. On the date, just a few hours after the robbery, several boxes in which the jewelry had been stored were found near Geneva, Ind. That indicated the stolen jewelry had been transported across state lines and that was a violation of federal law. That’s how the FBI entered the chase, and that’s how all the rules changed on April 27. Within days, they were charged with violations of the National Stolen Property Act and the National Motor Vehicle Theft Act, and eventually for bank robbery. All federal offences. As the federal charges were being filed, the three were back in Ohio where they burglarized a house in Gallipolis. Dalhover said they next traveled to Wheeling, W.V., where they considered holding up a jewelry store but decided instead to go to Baltimore where they held up in a rooming house. With a special FBI squad and police from several states looking for them, they decided to live quietly in Baltimore and continue their criminal activities a safe distance away so they couldn’t be traced. A serious of grocery store holdups followed in various towns surrounding Baltimore. About the middle of October, the three men started taking their meals at a restaurant in Baltimore where Minnie Raimondo, 18, worked as a waitress. Shaffer, then using the name George Riley, became friendly with her and started seeing her outside the restaurant. He informed her that he was a cabinet maker from Bangor, Maine, in Baltimore on a vacation. 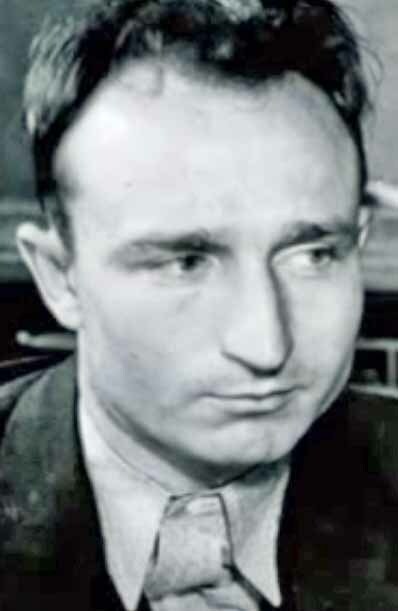 He further said his friends Herbert Schwartz and Edward Maxwell (Dalhover and Brady) owned a furniture factory there and that they had to go to Maine every few weeks to look after their business. Shortly after Shaffer started going with Minnie, she invited him and his two companions to her mother’s home for dinner. At this time, Dalhover met Minnie’s sister, Mary, 20, and started seeing her. Meanwhile, with money running low, the gang decided to rob the State Bank at North Madison, Ind., and left Baltimore on Nov. 22. On the following day shortly after noon, Brady and Dalhover entered the bank, leaving Shaffer to drive the getaway car. They escaped with approximately $1,630 (about $30,000 in today’s money) and returned to Baltimore. On Nov. 28, Dalhover, who already had a wife and two small children, decided to marry Mary and Shaffer, Minnie. On Nov. 30, the two couples, along with Brady and a third sister, traveled to Elkton, where they had a double ceremony performed. Brady and Josephine, the third sister, were witnesses. Back in Baltimore, the two couples shared a rented a house at 3632 Roberts Place, while Brady rented a room across town. Dalhover and Shaffer built a workshop in the basement which they kept locked. Practically every day Brady would join them, and the three would spend most of the day in the workshop, telling the wives they were designing furniture and planning business expansions. It was later learned that they had been making magazines, extra shot clips, and mechanical improvements on the various guns they were using at that time. The lobby of the State Bank of Carthage in the 1930s appears quaint, but it was modern for its time. Pictured are, from left, bank employees B. F. Payne, Ben Lacy, and Dan Shaw. Their next target was the State Bank of Carthage in Carthage, Ind. They left Baltimore Dec. 15, drove to Marietta, Ohio, staying overnight in a tourist camp and going on to Carthage where they robbed the bank the following day. By the spring they needed more cash and on April 26, 1937, left for Farmland, Ind., where they robbed the Peoples Loan and Trust Company, escaping with $1,427. Prior to the robbery, the trio went to Chicago to purchase a machine gun at a sporting goods store. They could be purchased legally, but they were expensive, had to be registered and came with a very high tax (more than $3,000 in today’s money). Likely because of the paper trail that would result, they decided against the purchase and returned to Baltimore. Shortly after this, on May 11, they drove to Bellefontaine, Ohio, with plans to steal another car as they were still driving the Chevrolet they stole when they escaped jail. They kept the car “safe” by constantly changing license plates from various states. On May 12, they stole a Ford sedan from two Ohio girls and drove both vehicles to Hamilton, where the Chevrolet was burned. They then went to Moscow and stole a .30 caliber machine gun from an American Legion Monument where it had been placed as a part of the memorial. About a week later, still in Ohio, they went to Felicity, where they stole another .30 caliber machine gun from yet another American Legion Monument. They returned to Baltimore, but were back on the road by May 23 en route to Sheldon, Ill., to rob another bank. When they arrived, however, they learned the bank had closed. They backtracked to Goodland, Ind., where they robbed the Goodland Stateland Bank on May 25 of approximately $2,528. About 15 miles from the bank, however, they encountered a state police car driving toward them. As the gang passed, it fired several shots at the police car and sped away. As the police car turned, the gang drove to a nearby church at a crossroads and parked behind it. Getting out, Brady took a machine gun. Shaffer and Dalhover took automatic rifles. A few minutes later, the police car drove up to the intersection and slowed. Indiana State Trooper Paul Minneman, 33, who was driving, opened the car door and leaned out in an effort to determine from the tracks which way the bandit car had gone. At this point, the bandits opened fire, hitting both Minneman and Deputy Sheriff Elmer Craig of Cass County, Ind., numerous times. As Minneman fell out onto the road, Craig staggered from the other side of the car and attempted to find cover. Minneman, hit 20 times, died two days later. One of the bandits, Dalhover never said who, picked up a rifle and walked over to Craig. Pointing the rifle at his head, he shouted, “Shall I finish this guy, too?” One of the others shouted back, “No, come on, let’s get the hell out of here.” The bandit took Craig’s revolver and a medical kit from the police car, while another took Craig’s shotgun and then walked over to the state trooper and took his gun and handcuffs. Craig eventually recovered from his wounds. Back in Baltimore, the trio purchased a small fishing boat and a motorcycle and spent June and July vacationing and visiting roller skating rinks. Brady loved roller skating and even had a custom skates made which he always carried with him. Brady even purchased a tavern which he operated for about a month before selling it. By early August it was back to business and another trip to the Mid-West to rob a bank was planned. On Aug. 7 they drove to a secluded spot outside Baltimore where they planned to leave their car and take another to the robbery. As they were transferring clothing and guns between the cars, however, they were seen by two Baltimore police officers who approached them. When the trio attempted to drive away, the police gave chase. The trio opened fire, disabling the police car. The trio escaped and abandoned their car some distance away. However, they left behind a .30 caliber rifle. Police and the FBI soon determined it was the Brady Gang and they eventually uncovered evidence of the two marriages. The wives and neighbors were questioned extensively. Law enforcement finally had a starting point, and one of the greatest manhunts in history was under way.